An excellent example of Nissui's efforts toward social contribution is its co-sponsorship of the "Umi to Sakana Competition" Independent Research and Artwork Contest. An excellent example of Nissui's efforts toward social contribution is its co-sponsorship of the "Umi to Sakana Competition" Independent Research and Artwork Contest. Toward the end of the 1970s, Japanese people had begun to eat less and less fish, and the consumption of fishery products was stagnating. Nissui's customer service center took up the challenge of how make to people more interested in fish again and, as a result, decided to co-sponsor the "Umi to Sakana Competition" Independent Research and Artwork Contest. The contest, which was held for the first time in 1982, aims to direct the attention of elementary school-aged children to "sakana (fish)", which hold an important position in the Japanese diet, and to the "umi (ocean)" that fosters the fish. This content is held once a year, with the aim of getting elementary school-aged children to learn about the relationship between the ocean and fish and their own lives from multiple angles through experience. It is hosted by the Asahi Shimbun Company and Asahi Gakusei Shimbunsha and supported by the Ministry of Agriculture, Forestry and Fisheries, the Ministry of Education, Culture, Sports, Science and Technology, the Japan Agency for Marine-Earth Science and Technology (JAMSTEC), the Fisheries Research Agency (FRA), the Japan Overseas Educational Services (JOES), and the Japanese society of Fisheries Science, with cooperation from the Japanese Association of Zoos and Aquariums and the Japanese Society of Fisheries Science. The contest in 2015 was the 34th consecutive event. For years, society has been calling for sustainable and effective utilization of resources of the earth and sea and protection of the environment. It is Nissui's hope to awaken interest among these young children, who will grow up to lead the coming generations, in the theme of "the ocean, fish, and us," so that they may be able to recognize fish as food and life forms, see the economical potential of enterprises such as fisheries, seafood processing, distributive trade, etc., and view the ocean as an indispensable factor in our lives as a reservoir of resources. During the contest, the children should consider this theme from various angles, and ultimately express themselves through works of art. It is in this hope that Nissui has continued to co-sponsor this contest for the last 34 years. vSome of the contestants in the past learned the value of even the smallest life and now work as physicians. There are cases of children who have applied for this contest because their older brothers and sisters applied to the contest before them, as well as cases of elementary school children who applied to the contest in the past that have grown up and now have their children apply to the contest. This contest has developed a powerful sense of history and ties among the contestants over the past 34 years. The first contest asked for submissions of independent research works, and approximately 2,200 works were submitted. Since then, the contest has been divided into two separate categories: the "research division" and the "creative division." The research division covers works of independent research and observation charts, while the creative division accepts works in 5 sub-categories of paintings, picture books, handicrafts, essays, and music. Application guides and posters are distributed to more than 20,000 elementary schools and drawing classes across the country as well as aquariums and research institutions, helping spread information about the contest. 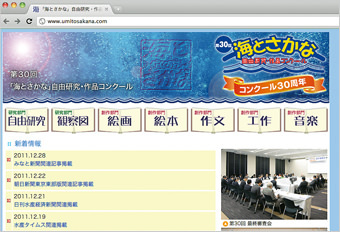 Since the 28th year, the contest has been advertised to overseas Japanese schools and continuation schools through JOES. The 34th contest received 29,736 submissions, more than 10 times that of the 1st contest. The total number of works submitted from the 1st contest to the 34th contest has reached 689,853 works, and the number of works submitted from overseas locations has grown rapidly from 382 works in the 28th contest to 1,268 in the 34th contest. The submitted artworks are examined in the final board of review, where officials including the Ministry of Agriculture, Forestry and Fisheries and the Ministry of Education, Culture, Sports, Science and Technology, researchers from JAMSTEC, and key figures from a wide range of fields including elementary school teachers serve as judges. 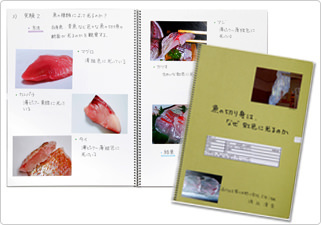 The judges are responsible for determining the winners of several prestigious awards for both the research and creative divisions, including the Ministry of Agriculture, Forestry, and Fisheries Minister's Award, the Ministry of Education, Culture, Sports, Science and Technology Minister's Award, the Japan Agency for Marine-Earth Science and Technology Chairman's Award, the Fisheries Research Agency Chairman's Award, the Japanese Society of Fisheries Science Chairman's Award, the Asahi Shimbun Award, the Asahi Gakusei Shimbunsha Award, the Nissui Award. In 2014 the award for wall newspaper in the group division has been introduced. In addition, the "Summer Active Learning Program" has been held since 2006 as a part of the contest advertisement PR activities. 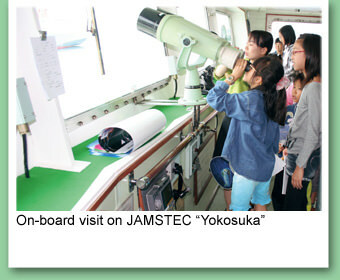 In this program, elementary school children are invited to JAMSTEC and Nissui group companies to observe and experience aquafarming, processing, and marine surveys. 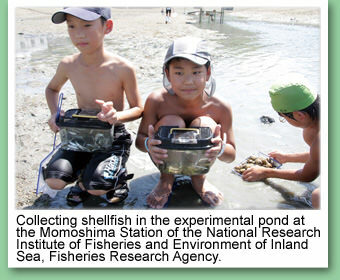 Furthermore, the "delivery class by researchers of fisheries science", visiting elementary school and give a class about the ocean and fish, has started in 2012. This class is annually held several times. 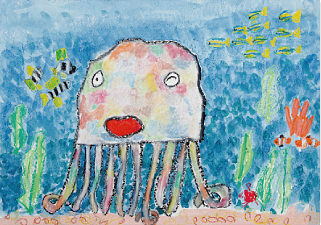 Nissui maintains high hopes that, through its sponsorship of the "Umi to Sakana Competition" Independent Research and Artwork Contest, as many children as possible will be interested in "the sea and fish," and that the children working on producing works of art for the contest will learn many things and grow up with an exuberant imagination and a caring attitude towards nature.